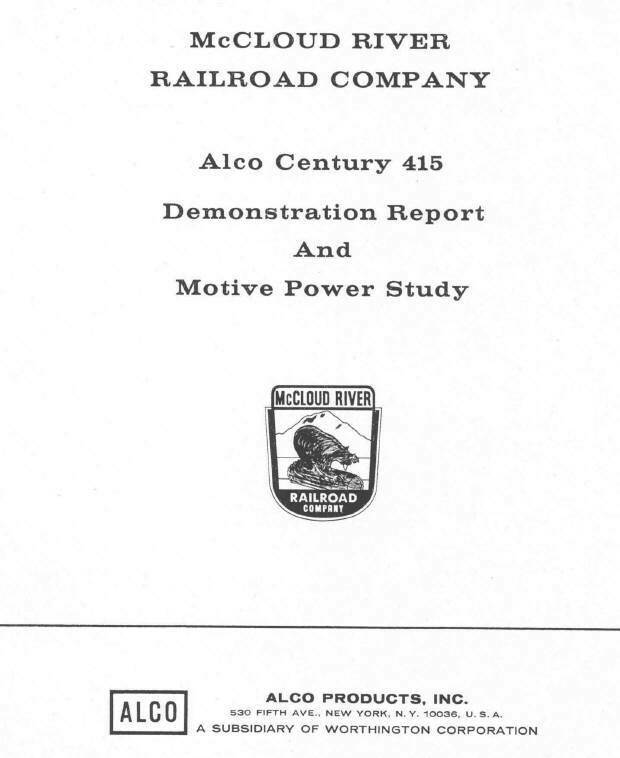 The cover of the report generated by the American Locomotive Company detailing the performance of their C-415 demonstrator unit on the McCloud River Railroad. Courtesy of Tom Moungovan, from the Ray Piltz collection. The McCloud River Railroad had a long relationship with the Baldwin Locomotive Works. Seventeen of the twenty seven steam locomotives owned by the company were Baldwin products, and twelve of those seventeen had been purchased new. This relationship continued into the diesel era, with the purchase of six new diesels from the manufacturer between 1948 and 1955. However, Baldwin was unable to adapt itself to successfully compete in the diesel market, and the company built it’s last locomotive in 1956. 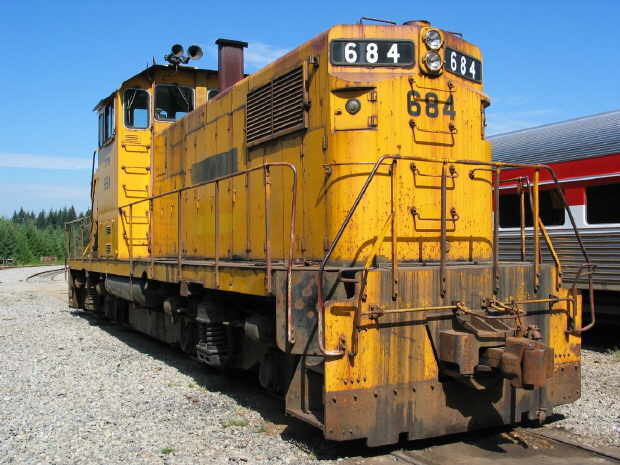 The Baldwin diesels were nearly perfect for the railroad, but the early diesels were not well known for longevity. The Baldwin era on the McCloud was lengthened with the purchase of three used Baldwin diesels from the Southern Pacific between 1963 and 1964. However, by the late 1960’s it was becoming clear that the Baldwins were wearing out and would need either major rebuilding or outright replacement in the near future. The railroad opted to search for replacement power. The American Locomotive Company (Alco) provided the only real competition to Baldwin during the steam era, and like Baldwin the company made the transition from building steam to building diesels. Alco proved to be more adept at building diesels that Baldwin , but once again the builder found itself in the #2 position, this time behind the Electro-Motive Division of General Motors (EMD). 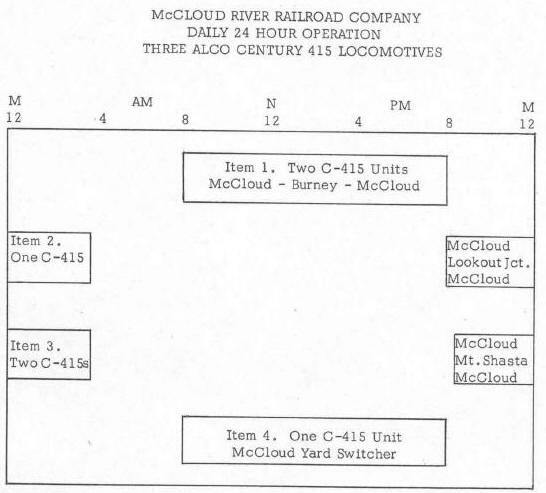 Only six of the McCloud River steam locomotives were Alco products, with four of them purchased new. With the fleet of Baldwin diesels rapidly failing, the railroad once again turned to Alco to see what the company had to offer. Alco sent it’s C-415 demonstrator unit to the McCloud for a weeks worth of testing, and after that test Alco produced a fine report detailing the performance of the demonstrator unit along with a proposal for the railroad to purchase three C-415s to replace the eight Baldwin diesels (six operational, two parts sources) then on the roster. Burlington Northern C-415 #4010 (still lettered for predecessor road Spokane Portland & Seattle ). This unit is equipped with the low profile cab and the high-adhesion trucks. This is an Ed Gibson photo, used with permission. Alco C-415 used by the Oregon Coastline Express on their tourist train out of Tillamook, OR on the Port of Tillamook Bay Railroad. This unit was built in 1968 for the Southern Pacific, and it passed through the hands of the Columbia & Cowlitz Railroad before arriving on the Oregon Coastline Express. After the OCE folded the unit went to the Spirit of Oregon Dinner Train, then to the Mount Hood Railroad, then to the Burlington Junction Railroad in Iowa where it is today. Notice that this unit features the standard AAR-type switcher truck (instead of the Hi-Adhesion truck) and has the higher profile cab. Steve Moore photo. 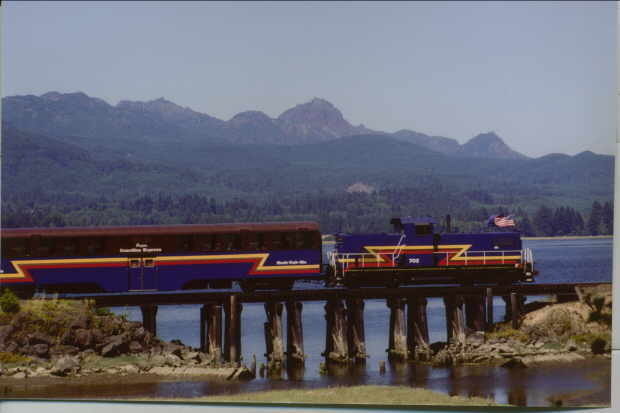 Another view of the Oregon Coastline Express C-415 along the shores of Wheeler Bay north of Tillamook , OR . 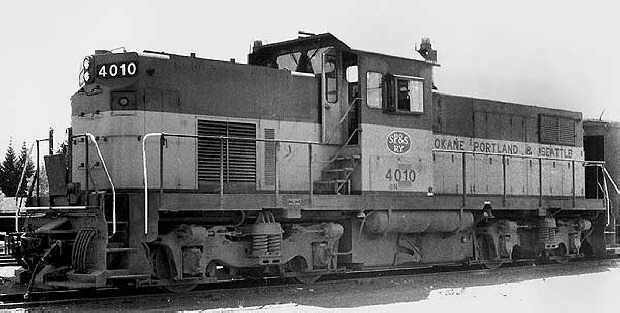 The C-415 was intended by Alco to be a medium duty road switcher, capable of handling most light low speed road jobs while being equally adept at yard switching chores. The model had the cab built in the middle of the unit, slightly off center to one side. The model was introduced in 1966 and was in production until 1968. 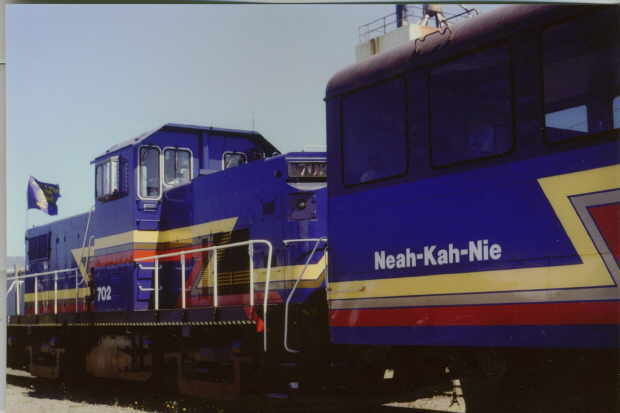 Several different options were available, including three different cab heights and a choice between standard AAR-type switcher trucks or high adhesion trucks. The prime mover, main generator and equipment blowers were located in the longer of the two hoods. The prime mover was an 8-cylinder model 8-251E, which was very unreliable and very off balanced. A drive shaft from the front of the prime mover ran underneath the cab floor to the shorter of the two hoods, where it ran the air compressor and flan clutch mechanism. The off-centered location of the prime mover caused the unit to be badly off balance, leading to excessive wheel slip and wheel wear. The cooling system was also problematic, as coolant had to be transported from the prime mover at one end of the unit to the radiator at the other end of the unit. The model was hardly a success, as only 26 were built. The 26 consisted of 1 demonstrator unit (medium height cab, AAR-B trucks), 1 to Monongahela Connecting in Pittsburgh, PA (low cab, Hi-Ad trucks), 1 to Chehalis Western in Washington (High cab, Hi-Ad trucks), 1 to Columbia & Cowlitz in Washington (High cab, Hi-Ad trucks), 2 to Spokane, Portland & Seattle (Medium cab, Hi-Ad trucks), 10 to Rock Island (Medium cab, AAR-B trucks) and 10 to the Southern Pacific (High cab, AAR-B trucks). 1. McCloud to Burney with trips to the lumber mills at Pondosa, Lorenz and Scotts and return to McCloud. This operation requires two units between the hours of 8:00 AM and 8:00 PM. 2. McCloud to Lookout Junction and return to McCloud. This operation requires one unit between the hours of 8:00 PM and 3:30 AM. 3. McCloud to Mt. Shasta and return to McCloud. This operation requires two units between the hours of 9:30 PM and 3:30 AM. 4. One unit is required at the McCloud Yard as a switcher between the hours of 8:00 AM and 8:00 PM. 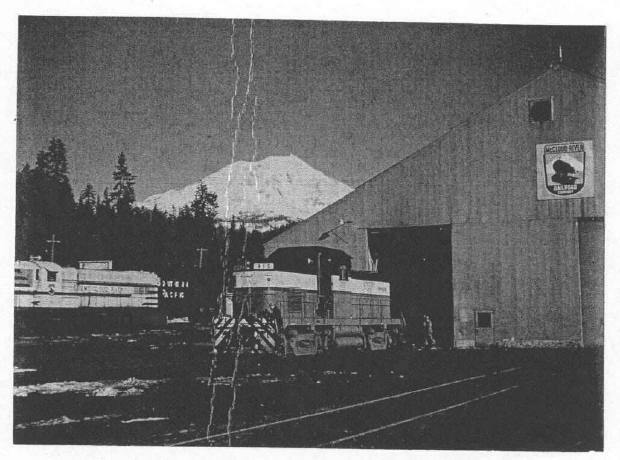 Picture from the report of the Alco C-415 demonstrator sitting in front of the McCloud shop. Courtesy of Tom Moungovan, from the Ray Piltz collection. A color shot of the C415 demonstrator in McCloud. Photograph from the Travis Berryman collection. The Alco report contained a day-by-day report of the movements of the unit, including analysis of the performance of the unit, some of which is worth reporting here. The descriptions also provide some fascinating insights into the operations of the road at the time. The demonstrator unit arrived at Lookout Junction via the Western Pacific and was towed dead to McCloud. The first solo run of the unit took place that night, when the unit took a train of 607 trailing tons (no caboose) to Signal Butte. The unit slipped quite a bit on the 4% grade leading up to the switchback, and at Signal Butte the demonstrator was cut off and returned to McCloud. Alco stated that the tonnage rating of the C-415 on a 4% grade is 560 tons at a continuous speed of 7.2 miles per hour, assuming an average car weight of 60 tons. Alco concluded that the demonstrator unit (which weighed 255,000 pounds) may have been too light to produce adequate adhesion to the rail. The demonstrator departed McCloud at 8:00 AM on the point of a Berry job. The train consisted of three loads, eight empties and a caboose. One of the loads was a 150-ton transformer on an 85-ton flatcar for a total car weight of 235 tons. The demonstrator stalled out on icy rails at a S-curve on the climb out of the Pit River Canyon , just south of the Lake Britton Bridge . The demonstrator had to double the hill to reach the top. Some cars were set out at the Arkrite siding (now gone) before continuing on to Burney, making additional setouts and pickups at Lorenz and Scotts lumber mills. The return trip to McCloud saw the demonstrator hauling 976 trailing tons, consisting of 13 loads and one caboose. Three of the 13 loads were 110-ton woodchip loads. The C-415 stalled out on the 2.5% grade at MP 47, about one mile south of Cayton. 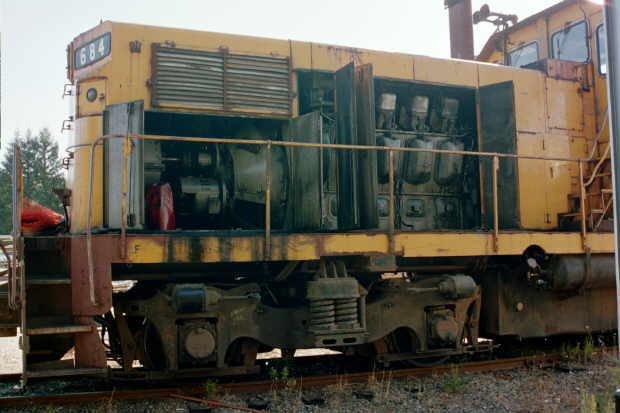 Alco attributed the stalling out to a bent sander on the lead sander on the right side of the locomotive, which caused sand to be deflected away from the flange area. The demonstrator ended up doubling the hill to Cayton, where the train was re-assembled. No further problems were encountered, and the train arrived back in McCloud at 8:00 PM. Immediately after arriving back in McCloud the C-415 took 7 cars (440 trailing tons) to Lookout Junction and returned with empties. The demonstrator made a successful roundtrip from McCloud to Burney and return on this day, switching lumber mills at Pondosa, Scotts and Lorenz along the way. The return trip departed from Burney at 3:35 PM with ten loads, three empties, and one caboose for a total trailing weight of 801 tons. Five additional loads weighing 289 tons were picked up at Obie, which filled out the train to 1090 tons. The unit made McCloud without any problems. After arriving at McCloud the unit once again went to Lookout with eight loads, one empty and one caboose for a total trailing weight of 548 tons. No problems were recorded. On this day the demonstrator again went to Burney, taking one load and sixteen empties for a total trailing weight of 530 tons. No problems were encountered. The returning train from Burney consisted of eleven loads, one empty and one caboose for a total trailing weight of 828 tons. Some slipping was reported, but the unit did not stall out. Upon arrival back in McCloud the C-415 was put to work switching the yard for the next four hours. Once the switching chores were complete the unit along with two Baldwin diesels (not otherwise identified) took 17 loads up the hill towards Mt. Shasta . The train consumed 45 minutes getting from McCloud to Signal Butte, with the C-415 operating in the “red” zone (1350 amps) at 5 miles per hour for that distance. Signal Butte was reached at 10:35 PM, and the traction motors were found to be cool to the touch upon arrival at Signal Butte. The train then continued the rest of the way to Mt. Shasta City and returned to McCloud with minimal slipping reported. The C-415 was again dispatched at 8:45 AM from McCloud, heading to Burney with three empties and a caboose. On the return trip the unit pulled twelve loads and a caboose for a total trailing weight of 907 trailing tons, including three chip loads with a cumulative weight of 290 tons. The unit made it to Obie with only an occasional slip. Five additional loads weighing 297 tons were picked up at Obie, increasing the train weight to 1204 tons. The C-415 made it back to McCloud with that train. The unit was again dispatched for Lookout Junction at 8:00 PM with fourteen loads and one caboose for a total trailing tonnage of 879 tons. The unit was apparently interchanged back to either the Great Northern or Western Pacific upon arrival at Lookout Junction. The above table was based on an average car weight of 60 tons and are rated for a C415 operating at a continuous speed of 7.2 miles per hour with a 72/14 gear ratio. In the table above, Westbound trains would be those traveling from Burney to McCloud, or from McCloud to Mt. Shasta City , with Eastbound trains operating the opposite direction. 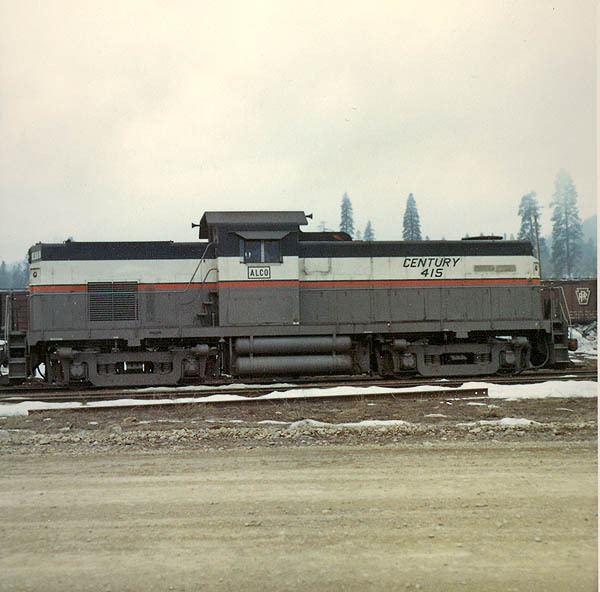 American Locomotive Company submitted a proposal as part of the report that the McCloud River Railroad replace all six active Baldwin diesels on the roster at the time with three C415s equipped with high adhesion trucks, ballasted to a weight of 260,000 pounds, and with a gear ratio of 74/18. Alco included in the report a proposal showing how the railroad could maintain the ‘round the clock operating pattern at the time. Graphic depicting how the McCloud could maintain 24-hour a day operations with three C-415s. Courtesy of Tom Moungovan, from the Ray Piltz collection. In hindsight, it is fortunate that the McCloud River did not accept Alco’s proposal. 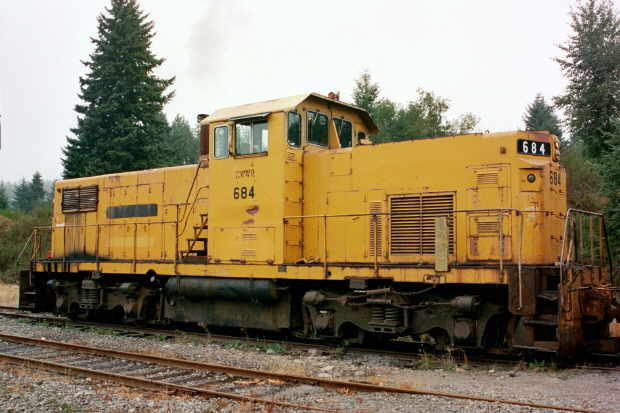 The EMD products that the railroad purchased instead two years later have proven to be much more durable machines than the Alco C415 was, and had the McCloud River gone ahead with the purchase they would have been facing a major motive power crisis right at the point in it’s history when it could least afford it. Market forces finally forced the American Locomotive Company to exit the locomotive building business in 1969. The demonstrator unit that tested on the McCloud was sold to an Australian mining firm and is currently on display at Dampier , Australia . Below are several pictures of a C415 that closely resembles what McCloud River C415s might have looked like, with the high profile cab and the high adhesion trucks. This particular unit was built in July 1968 and c/n 6003-1. It served a succession of logging and lumber railroads owned by Weyerhaeuser Timber Company (Chehalis Western, Curtis Milburn & Eastern, back to Chehalis Western) in the greater Tacoma area before being sold with the railroad to the City of Tacoma . The unit is currently leased to Railcar America , a freight car repair business, that operates out of the old Weyerhaeuser shop building at Western Junction, WA. All photos are by Tyler Whitcomb and are used with permission. Broadside view of the #684. The prime mover is located in the hood on the other side of the cab. View through open hood doors at the prime mover and generator located in the longer of the two hoods. Wedge shot of the front and side of the Chehalis Western C415.